When Does the Monster Hunter World Beta End? Get in as much playtime as possible with the Monster Hunter World beta before it finishes! Monster Hunter World’s final beta is kicking off soon on PlayStation 4 ahead of the game’s full release on January 26, and avid players everywhere are preparing their consoles for the download. Considering the beta is happening so close to release, and that it’s the last chance for you to get a sneak peek, you're going to need to know when the Monster Hunter World beta ends. The Monster Hunter World beta is only going to be around for a short time, so jump in and get as much playtime as possible. Below are the times the beta starts and ends, in UTC, PT, and ET timezones. If your timezone isn’t listed below, you can use a timezone converter to figure out when the beta will start and finish for you. 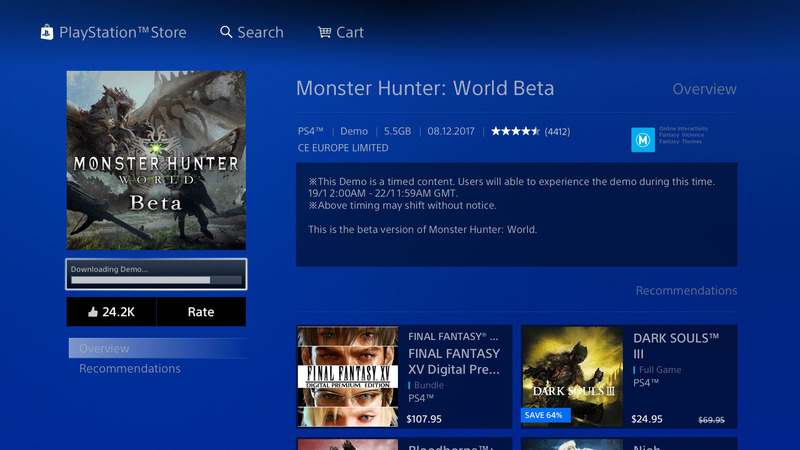 Make sure you’re ready to dive in by downloading the Monster Hunter World beta as soon as it’s available. While it’s only going to be around for 3 days, there’s a lot to do in the Monster Hunter World beta. Capcom has added a new quest to the beta, where you’ll be able to track down and hopefully kill the enormous Nergigante creature. The purpose of the beta is to test server load and will be using worldwide multiplayer matchmaking, so some hiccups should be expected. By the time the Monster Hunter World beta ends, there will only be five days left until the game’s full release, so at least there’s not long to wait to play it again. We’ll be covering Monster Hunter World here at Shacknews, so be sure to check back for some handy guides and walkthroughs!